Located in Cape Town’s historical Constantia Valley, on the breathtaking slopes of Table Mountain, all the rooms and suites of The Cellars-Hohenort boast panoramic views of the impressive mountain and the beautiful grounds. Set in nearly 9.5 acres of world renowned gardens, this historic and beautiful country escape in the city offers guests far more than just incomparable scenery. A fifteen minute drive will take you to the centre of Cape Town, South Africa’s oldest city, famous for its natural beauty, cuisine and wine. Back at the hotel there are three award-winning dining experiences, including The Greenhouse, where cuisine focuses on regional flavours with modern interpretations. All of this is the result of owner Liz McGrath’s more than twenty years of hard work, love and endless inspiration. The Cellars-Hohenort boasts 48 individually decorated rooms and suites, all situated in an awe-inspiring natural setting. Check-out time is at 11h00. Any requests for a late departure are subject to availability and may be subject to a late departure fee of 50% of the applicable room rate. Late departures after 18h00 are subject to a charge of one additional night’s accommodation. We welcome children of all ages. Children under the age of 3 can be accommodated across all room categories in a camper cot with their parents. One child up to 14 years of age can be accommodated in their parent’s room, with an extra bed, charged at R950.00 per night, when booking selected Luxury double rooms and guaranteed when booking Suites or Premier Suites. The balance to be paid 6 weeks prior to arrival. All cancellations must be received and acknowledged by our Sales Office in writing. In the event of an early departure or no show, the Company will be liable for all the nights confirmed. 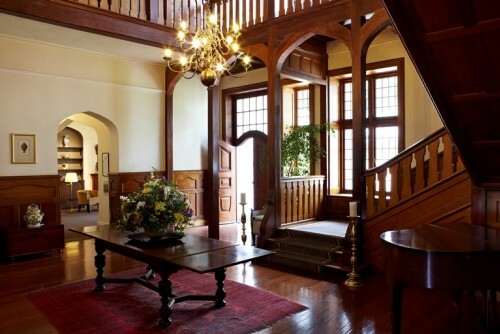 The Madiba Villa is a gorgeous double-story Cape-style private villa situated in the beautiful Cellars-Hohenort gardens. A selection of fascinating pieces - about Nelson Mandela´s life - make sure that it is so much more than just a villa, it is a part of South African history.With its own private courtyard, swimming pool and entrance, The Madiba Villa offers guests a luxurious home away from home.The Madiba Villa boasts a large open-plan sitting and dining room with a fireplace, built-in bar, service kitchen and two or - if need be - three double en-suite bedrooms with walk-in cupboards. 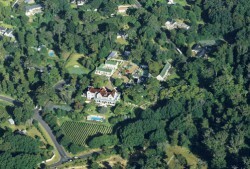 The Madiba Villa is fully air-conditioned with under carpet heating throughout and a private driveway. The Cellars-Hohenort offers eight individually decorated Premier Suites ranging, in décor and design, from the traditional to the contemporary. Each Premier Suite is superbly spacious, which makes them ideal for guests looking for a little extra room.Select either a one-level or split-level Premier Suite and enjoy a private walled garden or magnificent garden views. Both styles of Premier Suite boast a separate lounge, basic kitchen area, private satellite TV, a beautifully appointed bedroom and an en-suite bathroom. If you´re looking to experience the ultimate in luxury, the first step is a Premier Suite. In true Cellars-Hohenort style, the Suites are all individually and tastefully decorated with a unique twist. All décor draws its inspiration from the beautiful garden surrounds. The Suites offer a spacious separate lounge area, a walk in closet and a substantial mini-bar. A suite that can serve as your home away from home. You´ve found your perfect partner in The Cellars-Hohenort Suite. The Luxury Double with Verandah rooms, located in the historic 100 year-old Hohenort Manor House, showcase panoramic vistas of the Cape Peninsula and False Bay. The Luxury Double with Verandah room offers guests a large private balcony, the perfect spot to experience the exceptional range of views on offer. Far more classically decorated than their Luxury Double room counterparts, the Luxury Double with Verandah rooms are all individually decorated with the trademark Cellars-Hohenort style. If you are looking for a room that offers luxury, comfort and makes you feel instantly at home, The Luxury Double with Verandah is the perfect room for you. The Cellars-Hohenort has a number of individually decorated Luxury Double Rooms. These are located in both the 100 year-old historic Hohenort Manor House and the newer Cellars Main House. It is a selection that will leave you spoilt for choice. The Luxury Double Rooms in the Hohenort Manor House boast Edwardian ambience and panoramic vistas of the Peninsula, False Bay or the surrounding mountains. While the Luxury Double Rooms in the Cellars Main House are more modern in their design, showcasing bright and beautiful décor with sublime views of the award-winning gardens. Individually decorated, with the emphasis on combining comfort and the ultimate in luxury, the Double Rooms are a great introduction for a first-time stay at The Cellars-Hohenort. 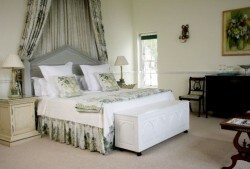 Boasting tranquil views - of the award-winning gardens - the Double Rooms offer en-suite bathrooms. A range of Double Rooms open directly onto the beautiful gardens, while a selection of Double Rooms boast far-reaching garden vistas from their individual balconies. Restaurants, including The Greenhouse and The Conservatory and The Cape Malay Cooking Experience. THE GREENHOUSE expertly showcases the cuisine of Cape Town’s first Relais & Chateaux Grand Chef, Peter Tempelhoff and his talented team. Here, the tasting menus are inspired by the bountiful local produce and diverse cultures of South Africa. The cuisine playfully combines international techniques and styles with local ingredients and flavours, resulting in dishes that surprise and leave a lasting impression. The 3 tasting menus and à la carte menu, expertly paired with superb wines from the surrounding wine region, will impress even the most seasoned of diners. Limited seating, for just 45 people, ensures that each guest experiences the most intimate dining affair. This experience, coupled with the unforgettable cuisine, where guests find themselves lingering over every bite, creates a culinary story unique to The Greenhouse. THE CONSERVATORY, situated adjacent to the historic Cellars-Hohenort cellar, offers diners unparalleled garden vistas from both the sun-drenched terrace and the indoor tables. Carefully constructed around a giant 300-year-old oak tree, The Conservatory is one of Constantia´s finest daily breakfast, lunch and dinner venues. Here head chef Delia Harbottle creates hotel classics alongside modern and seasonally influenced dishes. The Conservatory menu places a great emphasis on fresh produce from both The Cellars-Hohenort gardens and local green-friendly suppliers, and this gives it the unique ability to showcase a true taste of the Constantia Valley. Friendly service and an award-winning wine list ensure that The Conservatory offers guests and locals an exceptional everyday dining experience. P.S. Why not try The Conservatory´s unrivalled Sunday Lunch? You´ll have the opportunity to experience a selection of Mrs. McGrath´s own tasty recipes. 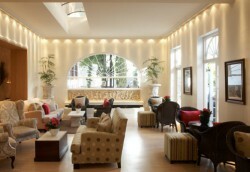 THE MARTINI BAR is The Cellars-Hohenort´s in-house bar. Offering an exclusive range of exceptional cocktails, it is a hotel bar unlike any other. During the day it is a relaxed space to meet for high tea or single estate coffees.When night falls, The Martini becomes a superb location to enjoy the finest selection of award-winning Constantia wines, chic Champagne and magnificent martinis. The Martini´s namesake holds pride of place in the cocktail menu and, if you´re a martini lover - or you possess a dash of the 007 - you won´t want to miss out on a night at The Martini Bar. For those that prefer to stick to something a little more sublime, bubbly by the glass and magnificent wines from The Cape are also available. THE FERB BAR Located in the Hohenort Building, is ideal for enjoying a glass of sparkling Champagne before experiencing the gastronomic journey of the senses at The Greenhouse. 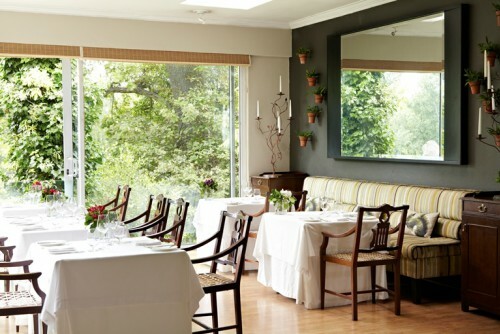 Decorated in soft greens with windows overlooking the award winning gardens, during the day it provides a tranquil respite for those looking to have a quite drink or afternoon tea while settling into a good book. 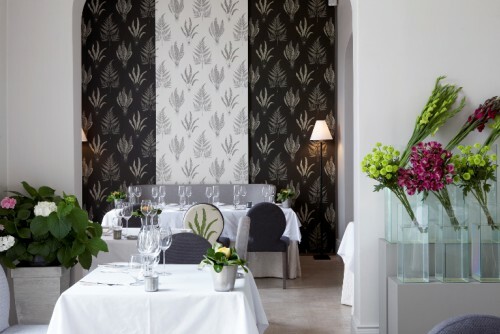 The Fern Bar provides access to the terrace at the Hohenort Building where guests can sit and take in the panoramic views across the Constantia Valley to False Bay. Peter`s approach to food is simple, “If it is not the best it can be, it doesn`t belong on the menu!“ It is an approach, which he stakes his reputation on every day, and one that has garnered him with many (enviable) awards and accolades over the years.This approach to cooking is expected and evident in each of the 5 restaurants of Liz McGrath`s Collection which Peter oversees. Be it the elegant gastronomic Greenhouse, or the simplistically precise Seafood restaurant at The Marine, perfection is the ultimate goal that Peter`s food aspires to. Currently, Peter holds the position of Executive Chef in the ‘The Collection by Liz McGrath’. He continues to explore, understand and re-imagine what South African food can be by investigating local flavour through ingredients specific to his locale. In his words, all he has to do now is “keep innovating, keep coming up with new things, new dishes, new flavours, and always keep stretching the boundary." 1. Travel on the N2 Highway towards Cape Town, take the turn off to “Muizenberg, M3“ to the left. 2. 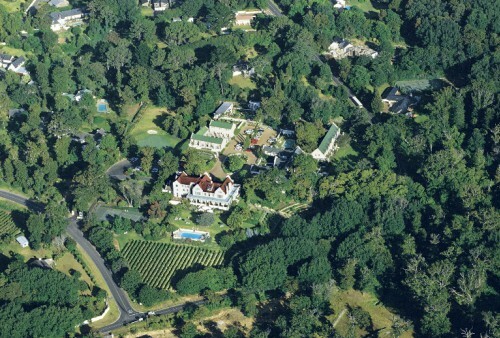 Continue along the M3 (Edinburgh Drive) past the suburbs of Claremont Bishop`s Court and Wynberg. 3. Take exit 14 marked Constantia.